Check out our Photo Gallery to Get Inspired! Not sure what message you'd like to put on your customized chopsticks? No problem - simply look below to find our suggestions for wedding, love, birthday, anniversary, humor, Asian, friendship and Christmas. If you're still stumped or require personal assistance to translate names etc, please feel free to contact us. 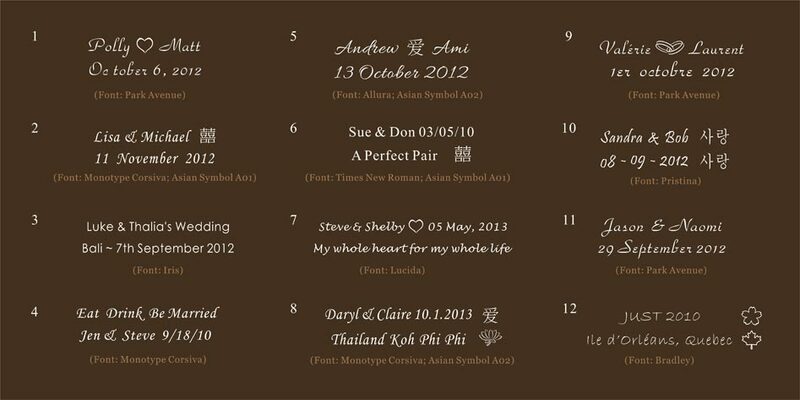 Our personaization specialists will be very happy to look into our database and even create a few customized designs with different fonts, Asian symbols and graphics for you to choose from, free of charge!